Over the past month or so I’ve been running a number of performance tests on VxRail and vSAN solutions. HCIBench is a brilliant tool to help end-users understand the type of performance that they can achieve with their vSAN solution. It’s essentially an automation wrapper around the popular Vdbench tool. Vdbench is an utility specifically created to help engineers and customers generate disk I/O workloads to use for validating storage performance and storage data integrity. Vdbench is a complex beast to run, with lots of different variables that can be configured via CLI… so the HCIBench wrapper helps simplify workload profiles and makes it so much easier to run benchmark tests!! Please note, HCIBench is a VMware Labs Fling and so there’s limited support available and it shouldn’t be used in production environments (although the latter is just to cover themselves). If I’m honest, the creators of HCIBench are pretty good at replying to comments and feedback! It’s definitely worth remembering that as a benchmark tool, it can’t quite simulate real-world workloads! However, if you understand how your workload behaves (ie block size, read/write ratio, etc) then you can get pretty close to creating a workload profile that matches your workload (albeit running a test at max. workrate rather than the bursty rate we see in real-life). HCIbench was updated 2 days ago in response to the recent release of vSphere 6.5u1, and in my opinion is even cooler now that it can utilise the new vSAN Performance Diagnostic feature of vSAN 6.6.1 (API integration with the new Performance Diagnostics part of vSAN Cloud Analytics). You can now run an HCIBench test and view detailed results of the test in Performance Diagnostics with supporting graphs – you’re able to select a goal for the test based on “Max IOPS”, “Max Throughput” or “Min Latency”, and then get details on potential issues found in the analysed data which you can then use to improve the workload profile you’re using in HCIBench. Last year I blogged about the vCS to vCSA converter tool that VMware Labs released as a fling and how I had used it to pretty much convert all my lab vCenters (all bar one) to vCSAs….. since then I’ve been following the releases and a few months ago I noticed the Fling was deprecated (ie you can’t download it). I didn’t think much of it as VMworld 2016 was only round the corner, so thought it might be rolled into an impending vSphere/vCenter release….. unfortunately that never quite materialised in Las Vegas, and rumours are that vSphere 6.5 might be released in Barcelona. So I was quietly surprised when I got an email notification from VMware Blogs to inform me that a new minor update of vSphere had been released specifically for migration puposes – vSphere 6.0 Update 2m (where the ‘m’ stands for migration). vSphere 6.0 Update 2m is an automated end to end migration tool from a Windows vCenter Server 5.5 (any update) to a vCenter Server Appliance 6.0 Update 2 (so pretty much what the Fling used to achieve). It’s common knowledge that trying to migrate from a Windows vCenter Server (with a SQL backend) to a vCenter Server Appliance was not an easy task – in fact in 90% of my customers I’ve just told them to start a fresh rather than go through the pain of scripting a migration. However, I’m so glad that VMware have rolled out the Converter fling into an actual production release – now we have an end-to-end migration tool which takes all the pain out of the equation! Those of you who are interested in migrating from your Windows vCenter Server 5.5 (any update) to a vCenter Server Appliance 6.0 Update 2 should download and use this release. The vSphere 6.0 Update 2m download is an ISO consisting of the Migration Tool and vCenter Server Appliance 6.0 Update 2, roughly about 2.8GB in size. Note: you cannot use this release to deploy a new installation of vCSA! To do that you just use the vCSA 6.0 Update 2 install. Previous versions of Windows vCenter Server will need to upgraded to vCenter Server 5.5 prior to migration. The best thing is that all database types currently supported with vCenter Server 5.5 will be migrated to the embedded vPostgres database in the vCSA! It’s worth noting that if VMware Update Manager is installed on the same server as the Windows vCenter Server 5.5, it will need to be moved to an external server prior to starting the migration process. VMware and 3rd party extension registrations are migrated, but may need to be re-registered. vCenter Server 5.5 both Simple and Custom deployment types are supported. Configuration, inventory, and alarm data will be migrated automatically, historical and performance data (stats, tasks, events) is optional. If the source was a Simple vCenter Server 5.5 install (so SSO + vCS) then it will be migrated to a vCSA with embedded PSC. If the source was a Custom vCenter Server 5.5 install (so separate SSO and vCS) then it will be migrated to a vCSA with external PSC. It preserves the personality of the Windows vCenter Server which includes but not limited to IP Address, FQDN, UUID, Certificates, MoRef IDs. Changing of your deployment topology during the migration process is not allowed. For example, if your vSphere 5.5 Windows vCenter was deployed using the Simple deployment option, then your Windows vCenter Server 5.5 will become an embedded vCenter Server Appliance 6.0. During the migration process the source Windows vCenter Server will be shutdown, plan accordingly for downtime. The migration tool will also be performing an upgrade, standard compatibility and interoperability checks will still apply. Please use the interoperability matrix to make sure all VMware solutions are compatible with vSphere 6.0. Also talk to your 3rd solution vendors to make sure those solutions are also compatible with vSphere 6.0. I’m currently in the process of digging out an old vCenter Server 5.5 ISO so that I can deploy it and upgrade it using the new release! 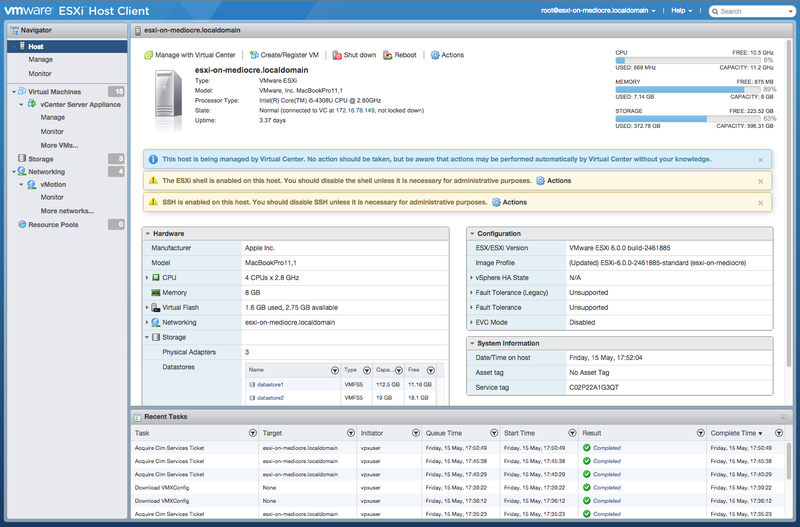 Anyways, those of you who haven’t yet upgraded to vCenter Server 6.0 and to an appliance, now there’s no reason why you can’t as you have a fully supported tool from VMware! Best of all, they’re in the process of improving the migration tool so that it can be used to migrate from a Windows vCenter Server 6.0 install to a vCenter Server Appliance 6.0. One feature I hope they will also include is the ability to migrate from an existing vCSA to another vCSA. Unfortunately it was an API that was hidden away…. but the latest VMware Labs fling extends the functionality of PowerCLI to grant you access to the API.